There’s a small coffee shop a few blocks from our house in Denver and my son loves the scones from the shop. I think he likes them because they are basically a small cake, stuffed with blueberries and dusted with a ridiculous amount of powdered sugar. I’ll give him points for trying it, but he was clearly disappointed in the lack of fruit and the fact that there was ZERO powdered sugar. 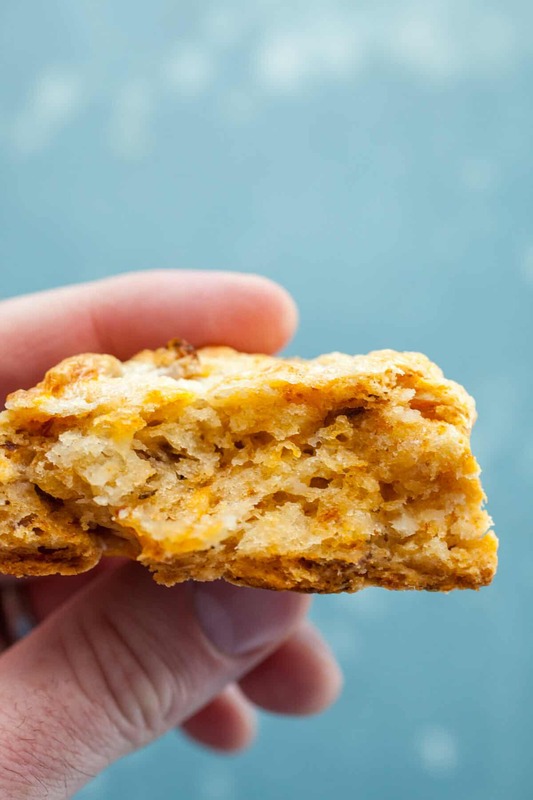 But, for me, these savory sun-dried tomato scones are exactly the kind of scone I love. They are a bit on the dense side, but still flakey and the flavor is intense and deep. They’d be a great addition to a brunch spread or to just have on hand for quick on-the-go breakfasts. 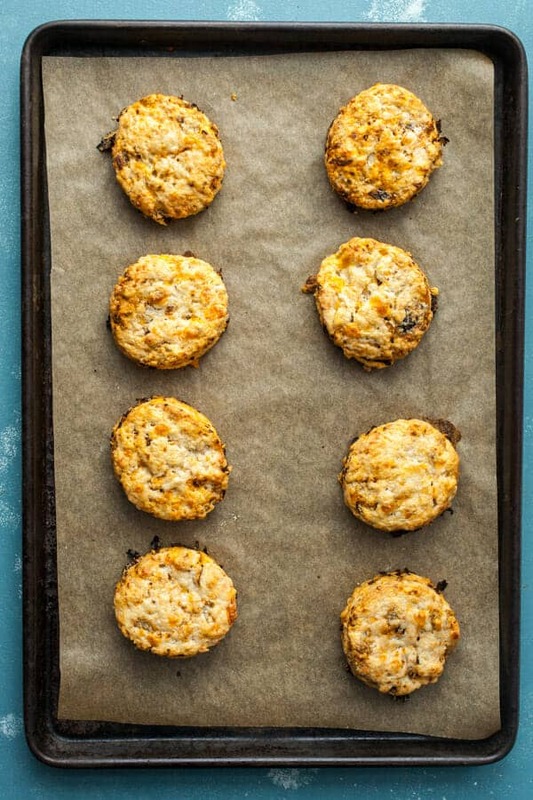 These easy scones are packed with savory sun-dried tomatoes and cheddar cheese. Perfect for a spring brunch! Preheat oven to 400 degrees F. Line a baking sheet with parchment paper. Grate cheddar cheese. Chop sun-dried tomatoes and blot them dry of any extra oil with a few paper towels. 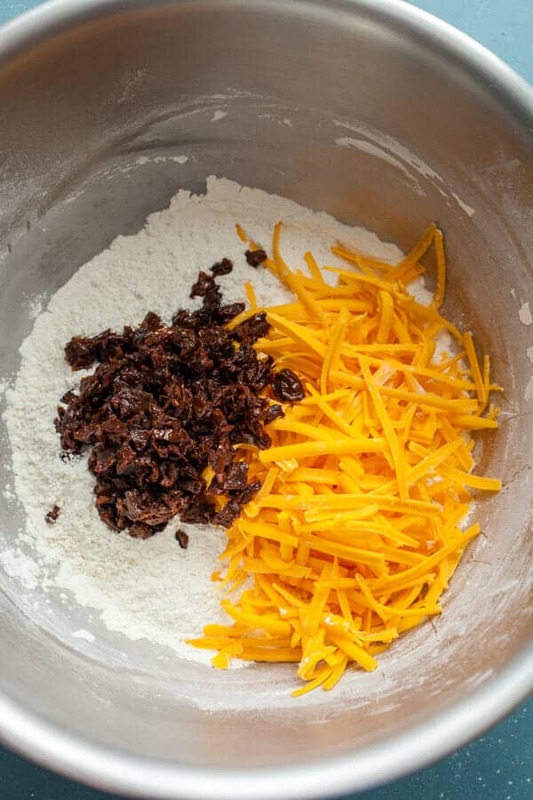 In a medium bowl, stir together flour, sugar, salt, and baking powder. Then stir in sun-dried tomatoes and grated cheese. Cube the cold butter and mash it into the flour mixture using either a dough cutter, a large fork, or even clean fingers. Make sure the butter is distributed evenly in pea-sized pieces. Pour in cream and stir the dough together. Knead it a few times until it comes together but don’t overwork it. Turn it out onto a lightly floured surface. Roll the scone dough out gently and fold it over. Roll it out again to a thickness of about 1/2-inch. Then either use a 2 1/2-3 inch round cutter to cut out scones or you can cut them into any shape you like. You should get 8-10 scones out of the batch and might have to re-roll the dough one time. Transfer scones to prepared baking sheet and brush with cream. Bake scones for 20-22 minutes at 400 degrees until they are puffed and browned on all sides. 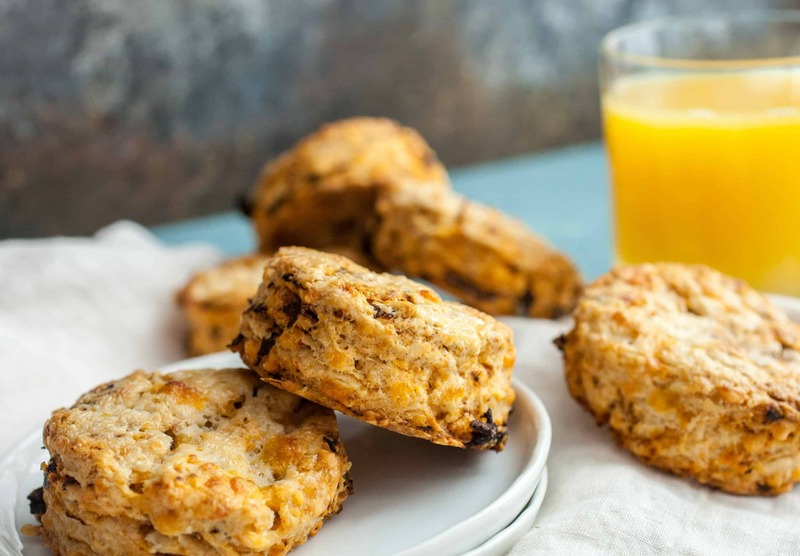 Remove scones and let cool for at least 10 minutes before serving! Enjoy! These are pretty easy to toss together, but there’s one very important trick. 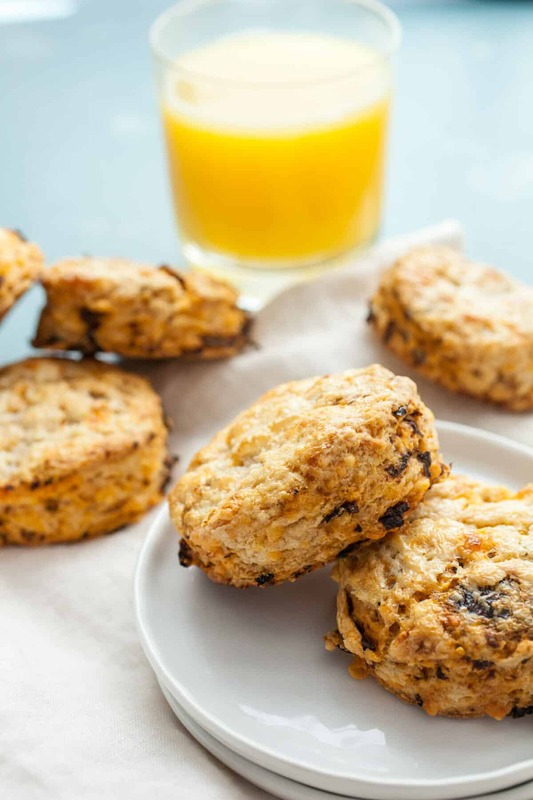 The best sun-dried tomatoes for this recipe are the ones stored in oil, but you don’t want to add all the oil to the recipe or the scones will be super greasy. So after you chop the sun-dried tomatoes, rub them over with some paper towels to soak up as much oil as possible. Then you can stir the cheddar and tomatoes into the other dried ingredients. Then cube in your cold butter! 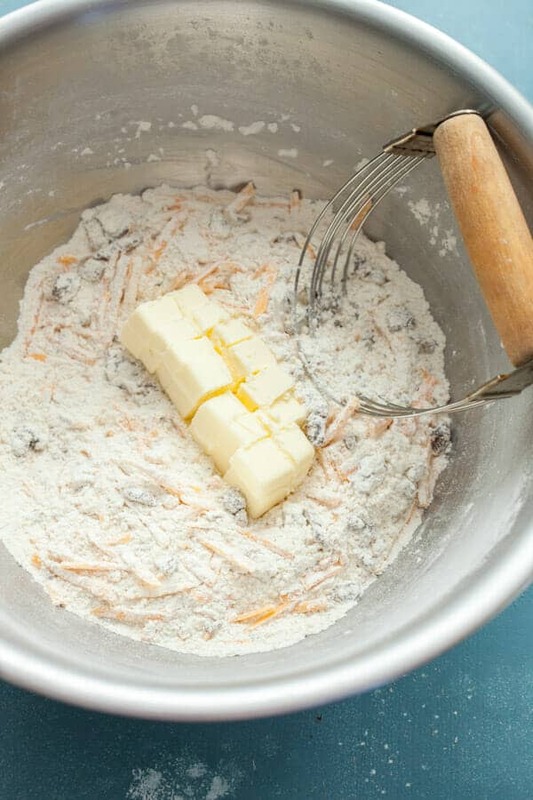 You can use a pastry cutter or just a large fork or even your clean fingers to work the butter into the flour. Finally stir in the cream and gently knead the dough until it just comes together. Try not to overwork it. 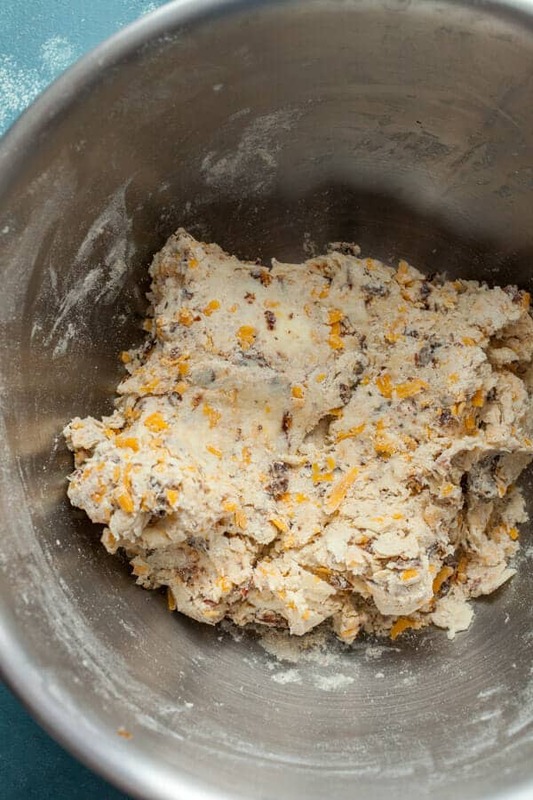 Roll the dough out to about a 1/2-inch thickness and cut out your scones! I used a round cutter for mine but you could cut them in any shape you like. You should get 8-10 scones out of the dough. I like to brush my scones with cream before baking them. Normally I would bake scones at about 425 degrees F. but I turned these down to 400 so the tomatoes don’t burn. They will need 20-22 minutes to finish baking. 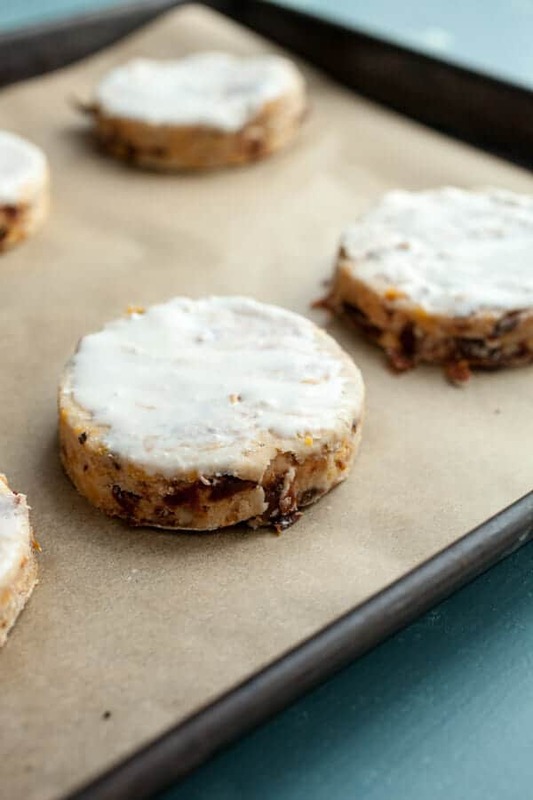 I loved how these sun-dried tomato scones turned out! These look great and I’m totally going to try them out this weekend for a brunch! !